Obstructive sleep apnea is a common cause of daytime sleepiness, yet 80% of the people who have it don’t even know it! Could you be one of them? 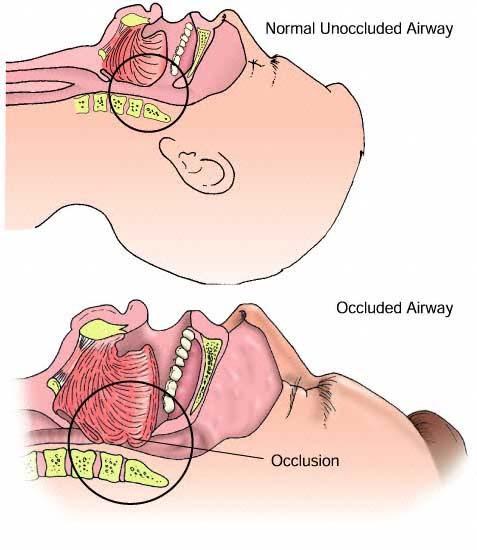 Obstructive sleep apnea (OSA) refers to recurrent episodes of upper airway collapse during sleep that cause a person to stop breathing (apnea). These episodes may occur hundreds of times per night. Each episode is associated with some level of arousal from sleep. The most obvious result of OSA is a very restless sleep. This leads to excessive daytime sleepiness. At first, you may notice falling asleep very quickly while reading or watching TV. Eventually, excessive sleepiness interferes with more important activities, such a driving. People with OSA are 2-7 times more likely to be in a car accident than people without sleep apnea! In addition to interfering with your everyday life, OSA is also bad for your health. OSA is a risk factor for high blood pressure. This can eventually lead to an enlarged heart and a risk for heart failure. The incidence of stroke and heart attack are higher in people with OSA. Also, people with OSA are more likely to develop irregular heart rhythms (arrhythmias). In rare cases, these arrhythmias could cause sudden death. The signs of OSA are loud snoring, witnessed apneas, gasping and choking sounds that cause arousal from sleep, restless sleep, and excessive daytime sleepiness. The risk factors for OSA are obesity (BMI > 28 kg/m2), male gender, increasing age up to 60 years old, alcohol use, enlarged tonsils, and craniofacial abnormalities (eg. small jaw). Overall, the typical person with OSA is a middle-aged man who is overweight and has a thick neck (collar size > 17.5 inches). If you think you have OSA, you should see your doctor for an overnight sleep study. A variety of information will be recorded while you sleep, including brain activity, heart rhythm, and breathing. This test diagnoses OSA, and rules out other causes of restless sleep. One of the best treatments for OSA is weight loss. A 15% reduction in weight can significantly improve the symptoms of OSA. Also, avoiding alcohol and sleeping on your side may help. Other than these lifestyle changes, CPAP (continuous positive airway pressure) is the most effective treatment. CPAP involves wearing a mask while you sleep that keeps air continuously moving into your nose and mouth to keep your upper airway open. The use of CPAP will improve sleep, decrease daytime sleepiness, and decrease blood pressure. Surgical resection of the uvula and soft palate (uvulopalatopharyngoplasty), or craniofacial reconstruction (advancement of the tongue, maxilla, or mandible) are options for severe OSA that doesn’t respond to lifestyle modifications or CPAP. Sleep Apnea and Heart Disease, Philipson, Eliot A. Harrison’s Principles of Internal Medicine-Online. Ch. 264 Sleep Apnea. 2004.